Yesterday I read some awesome news! The Euclid Beach Carousel is close to being fully refurbished and reinstalled near the former Euclid Beach Park! This beloved carousel at this former beloved park will provide joy to the community once again. While in Northern Ohio back over the summer, we wanted to check out the site of this legendary park. 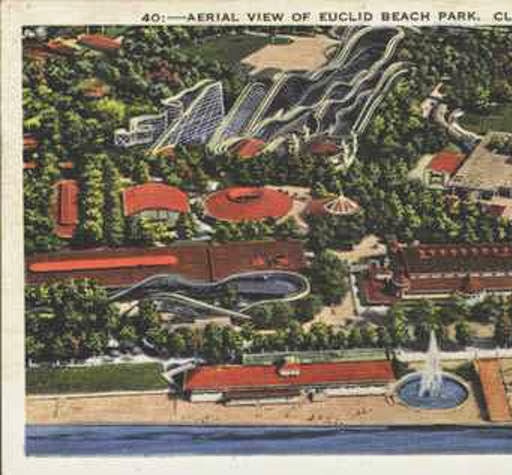 Euclid Beach Park was located on the east side of Cleveland. This legendary park closed in 1969 due to continued racial tensions. The park was the site of courageous protests to desegregate the pool and attractions in 1946. 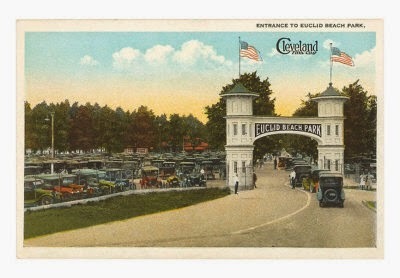 Unfortunately, the park and community were never able to fully alleviate the racial tensions, similar to the former Glen Echo Park near Washington, D.C.
One of the issues that the park had was that instead of integrating the attractions, they opted to just close attractions one by one. This lead towards a hostile environment and the eventual closure of the park. It is pretty amazing to see how far we have come in regards to civil rights in the short period of forty to fifty years in addition to being sickening to see. The park purported that it was a "family park," yet it engaged in these sorts of activities. It is a shame the park was unable to resolve the issues because the park had coasters from some of the absolute greatest roller coaster designers of all time, including Herbert Schmeck, John Miller, Ingersoll, and others. The park also suffered from the closure of the trolley line in 1963. 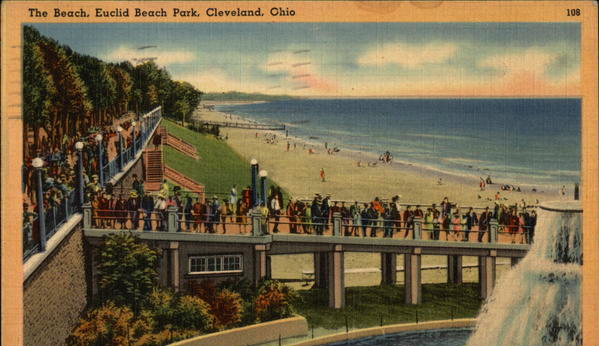 Easier access by way of the Interstate highway system allowed folks to more easily access parks like Cedar Point and Geauga Lake. Additionally, when the park was forced to desegregate, they went behind on the maintenance in the park and then blamed the decline upon the presence of black patrons in the park. This was a common scapegoat during this time period within amusement parks located in urban areas. In this time period, attention was focused more upon parks that were further out in the suburbs and the country. Large suburban parks were already in the works, such as Kings Island, Kings Dominion, Great Adventure, the Marriott Great America parks, and others. The urban parks were threatened at this point. Many closed in the late 60s and into the 70s, and the majority would definitely be gone by the end of the 80s. One of the only remains from the park is the wonderful gate. I am glad that they preserved this cool remnant. 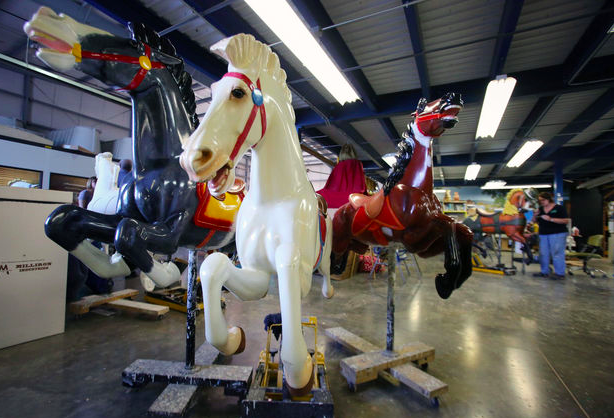 One of the most lasting contributions by this park is the park's racing carousel, which was relocated to Cedar Point and named the "Cedar Downs," a ride that still thrills riders, roughly 90 years after it was first made. The ride is one of only two remaining rides of its type, with the other located at Rye Playland in New York. They have a nice little picnic area next to the lake for the folks that live in the apartment buildings. I really wish we could have seen the park's former Schmeck PTC masterpiece, the Miller racing coaster, and their flying turns coaster. It is a shame that they let the park go in this manner. It is a lesson for us to see what we can lose when we let petty problems overcome our better judgement. We lost one of the this and some of the other best amusement parks during this era. These parks could have been courageous leaders in the civil rights movement. Amusement parks are places where everyone gets together to get over their troubles. Unfortunately the park ended up closing instead of being a place where everyone could go to relax. Hopefully we can look at the situation of this place as an example of what not to do in the face of conflict. Up for sale is our new 2015 Roller Coaster Calendar! The parks included are: Luna Park at Coney Island, Waldameer Park, Holiday World, Cedar Point, Six Flags America, Lakemont Park, Kings Dominion, Knoebels, Hersheypark, Dorney Park, and Seabreeze Park. 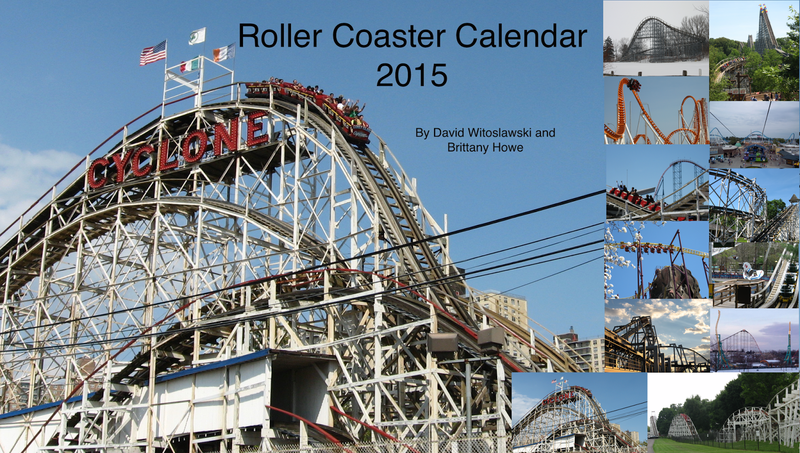 On special, the calendar alone is available for $12.00, our book "Great Pennsylvania Amusement Parks Road Trip" is available for $21.95, and with our special bundle price, you can get both the 2015 calendar AND the book for only $24.95! You can purchase the calendar using the drop down menu below! You can read more information about our book at this link. For Brit's birthday, I gave her a pair of tickets to see Steve Winwood and Tom Petty at Darien Lake Amusement Park near Buffalo, New York. We opted to stay overnight at the nearby Darien Lakes State Park, a nice and affordable place where we pitched our tent and relaxed by the campfire. The weather was cool on this September day, and I was surprised to see the waterpark in operation. Sure enough, quite a few people opted to take the plunge. Darien Lake has a nice entrance gate. This park feels like a nice mix between Geauga Lake and Six Flags America, with slight influences showing from the park's ownership by Funtime, and subsequently Six Flags. Ride of Steel towers over the south end of the park. It was not quite ready yet to open. We showed up pretty early. The Summers and Dinn Predator looms large over the center of the park. Darien Lake was Brittany's home park and this was my (Dave's) first visit to the park. We were both surprised at how decent Predator ran. It was still before opening time, and Predator was ready to open first, so that is where we headed. We decided to take the second ride to wait for the front. Can't wait for Ride of Steel! These two young ladies were the first riders of the day for Predator. They got the train to themselves! Predator has a very impressive structure. The verdict: Predator was awesome! I expected the worst judging by what Brit said it was once like, and the general track record of Summers and Dinn wood coasters. Dorney's Hercules was near and dear to my heart because the pre-lift, drop, and turn over the lake were awesome. The ride sort of fizzled out after that unfortunately, and ended up getting torn down. Another of their giants, the Texas Giant, received a steel track conversion by RMC. Nonetheless, I heard great things about the ride being greatly improved. Cedar Point's Mean Streak used to be one of the worst coasters, but over the last two years, the park has figured the ride out and now it runs fantastic. I am happy to report that this is the case with Predator as well! Brit was shocked at how much better the ride was running, and I thought it was a really decent ride. It has great pacing, decent airtime, and some fun lateral forces in the helix elements. It is a very compact ride that feels like it is running the way that it was intended to. It is both fun and slightly intense. It blew away my expectations and rode pretty decently. The compact and triple-out-and-back design is pretty awesome. I can see how it could have really stunk if it were not running well, but as it is, this is definitely a pretty good ride. There are several moments of decent airtime. This is definitely a ride that is the best in the front seat. More hands up! Over to the Ride of Steel. This is close to a mirror image of the Six Flags America, with it turning left instead of right after the lift. I prefer this ride of the two because of it's location going through trees and over the water. I could ride this all day. Easily one of my favorite steel coasters. We rode this over and over! This design is great with two very large helix elements, a plethora of powerful airtime hills, and a great layout. They really did a great job making the midways at Darien. This is a relatively new park, opening up in 1981, but I feel that the park has a great layout, with great character. Boomerang, eeessshhhh. I am among the few that enjoy Vekoma Boomerangs. I am spoiled though, after having ridden Hershey's Sidewinder Boomerang, with Vekoma's new strap shoulder harness. I had a bit of a headache after riding this boomerang. The lake in the center of the park acts as a reflection pool. I love the way that the Funtime park ownership placed a ferris wheel at the end of the main midway and at the center of the park. They made this great move at Geauga Lake too. Funtime consisted of Darien Lake, Geauga Lake, and Wyandot Lake. Darien is the only park the remains with their legacy, with Geauga Lake closed and Wyandot merged into Jack Hanna's Columbus Zoo. A Ferris Wheel is a wonderful thing to center a park around. This large ferris wheel was actually built by Vekoma and moved to the park after it was purchased from the 1982 World's Fair in Knoxville, TN. At that point, this was the tallest Ferris Wheel in the world at 165 feet. There is no shortage of pretty views at this park. The Zamperla Moto-Coaster is a terrific ride! This concept is very fun. This was my first time riding a coaster of this style. I did not expect the restraint system to be so comfy. 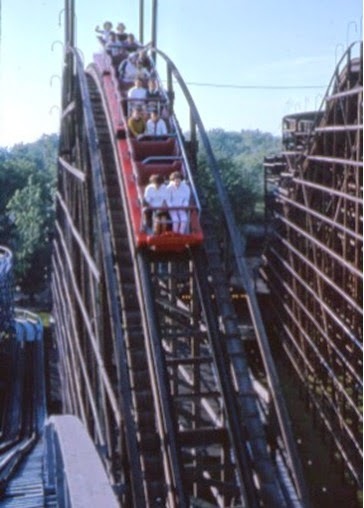 The curvy layout was filled with airtime. Riding in this position added an extra thrill to the ride. I would love to see more of these get built. But first we could not pass up the opportunity to hit in the batting cage! One of the unique things about this park is the emphasis upon physical activity. This batting cage would be a great example of this. There was also another ride that looked a little taller than your average frog hopper ride, but the riders had to pull their car up individually with a pulley system. I recall reading about an amusement park in Europe that had lots of these cool sorts of rides. I think anything to help folks get physically active like this is wonderful. There was something else that emphasized physical activity in the park, but I cannot recall what it was. In the early 80s, Darien Lake served as a prototype/show park for Huss. Included was the addition of some of the park's great flat rides, including the Thrillbilly, Corn Popper, Pirate, and Ranger. Arrow merged with Huss in 1981 and the Viper was built that year. Viper was Brit's first coaster when she was about 8 or 9 years old. I was surprised at how great the ride was. It looks wonderful with the recent black paint work and trains that have a green design on the side of them to look like a Viper snake. The inversions are fun and the layout is smooth and dynamic. The ride contains a loop, batwing inversion, and set of double corkscrews. The layout is set up so the inversions come at you in a pretty unexpected fashion. At the end, a helix wraps up the ride. This ride is very smooth and the layout is terrific. When this opened up in 1981, it had the most inversions in the world at five. At 121 feet up, I feel that this height is perfect for traversing through Arrow inversions. It is smooth, not too intense for traveling through the inversions, and the layout is spread out perfectly. This is a signature ride and one of my favorite Arrow creations. Now onto our favorite game, Fascination! We won a bunch of stuff, including one of those cool helicopter toy things. I love the skyline of the park. Similar to Dorney Park adding local Philly favorite, Chickie's and Pete's, or Kings Island adding Cincinnati favorite, Skyline Chili, Darien Lake was smart and opened up a location of Buffalo's venerable Anchor Bar. This establishment had a huge impact on American dining with the creation of Buffalo Wings. The wings are superb and I wish more parks would add local fare into their food service operations. I would love to see Kennywood add a Primanti Brothers location into the park, along with other parks with venerable local food establishments. The park has a tremendous collection of flat rides. The ride in the foreground is the Silver Bullet. This is the only remaining Heintz Fahtze Enterprise style ride. In the background is one of the company's paratrooper rides. The Silver Bullet is incredible! The average Huss enterprise is very fun, but not intense. This Heintz Fahtze model is intense! I highly recommend taking a ride on this. I can't say the same for the Mind Eraser SLC. Seldom do I dislike a ride. I flat out cannot stand this ride. I was surprised back in the spring at how the Six Flags America SLC was alright. This one was flat out brutal. I am not sure how a train can wobble so much trying to articulate a straight section of track. Wow is the only word I have for this. I would love for them to put something else in this large section. The location over the water would be ideal for a decent attraction. Happily, Viper, Predator, Ride of Steel, and the Moto-Coaster more than make up for this ride. Darien, the largest amusement park in New York State, has quite a few great attractions. The park also has a large selection of water rides. We opted not to ride them today, but you could easily devote a day to just the water rides at the park. The splash here is the only type of watermark you will see on my photos. I was THRILLED to see one of these spinning rides. Not many of them remain. The only other I can think of is the Dorney Park Apollo. Until a few years ago, one of these operated on top of the Garden Stage at Kennywood. These rides are really fun. The park's flat ride collection really blew me away. Viper attracts my eye again! The park has a cool little carousel. At first glimpse I thought it was a Herschell, but from what I am researching, I am finding that it is an International Amusement Devices (IAD) carousel, from 1980. This is right around the time that IAD folded. This manufacturer is not confirmed though. If anyone has some insight, please let me know. Behind it you can see the 185 foot S&S Space Shot (up) tower that the park purchased from Alabama Adventure when it closed a few years ago. One last ride on the (Superman) Ride of Steel before we head over to see Steve Winwood and Tom Petty! Ride of Steel is easily one of my favorite steel coasters. Both this and its close sibling at Six Flags America rank highly among my favorite steel coasters. They are my favorite Intamin creations and I do not think they get enough credit for how great they are. This is the view of the skyline from the amphitheater. It was beautiful! Don't look into the sun! Tried to catch the boomerang in this one. Eh, I would rather see Ride of Steel! Now for my favorite kind of traffic, Steve Winwood! He was great! He played mostly his older stuff from the Spencer Davis Group and Traffic, including I'm a Man, Them Changes, Can't Find My Way Home, Medicated Goo, Low Spark of High Heeled Boys, Empty Pages, Higher Love, Dear Mr. Fantasy, and last but not least, the legendary Gimme Some Lovin. Winwood was phenomenal and played for an hour to open up for Petty. He has not lost a beat with his voice. He still sounded great and he probably could have played the whole night with his many songs. Tom Petty and the Heartbreakers were phenomenal as always. They played for a good two hours, playing hits like Last Dance with Mary Jane, Into the Great Wide Open, I Won't Back Down, Free Falling, A Woman in Love, Learning to Fly, Refugee, Runnin Down a Dream, You Wreck Me, and American Girl. Below is a short video that I took of them playing Free Falling, a song name that is sort of applicable to our hobby. I also caught the cool lift lights on Viper at the beginning of the video. For some reason I am having trouble embedding the video, so here is the link to it! The concert really capped off a great day at the park. Music and amusement parks go hand-in-hand, with many of the traditional parks having ballrooms and bandshells in which the performers of their day would play to packed crowds. Darien is a park like this, in which the concerts are as much of a draw as the amusements. I highly recommend checking out Darien Lake. The entertainment offerings are diverse and the ride collection is well balanced. They have a decent amount of coasters. Enough so there is plenty to do, but few enough that you can get in a bunch of re-rides, along with one of the best flat ride collections out there. Darien is a fun place. Be sure to check it out, especially if one of your favorite artists is playing at the amphitheater!